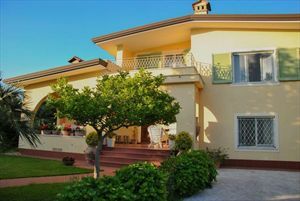 Villa for rent with beautiful flowering garden located in Forte dei Marmi (Caranna area) 1 km from the sea. In the property there are 3 parking spaces, gate, barbecue terrace, air conditioning, alarm system, wireless internet. Ground floor: entrance, living room with fireplace, kitchen, dining room, laundry room, master’s bedroom, 2 bathrooms. First floor: 4 bedrooms, 3 bathrooms, 2 balconies.